"In many Masses, the Nicene Creed follows the homily. 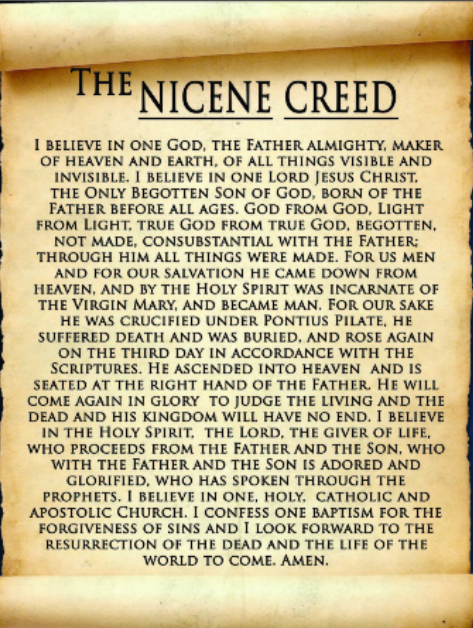 The Nicene Creed is a statement of faith dating from the fourth century. 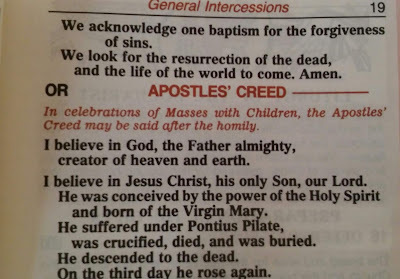 In certain instances, the Nicene Creed may be replaced by the Apostles’ Creed (the ancient baptismal creed of the Church in Rome) or by a renewal of baptismal promises, based on the Apostles’ Creed." 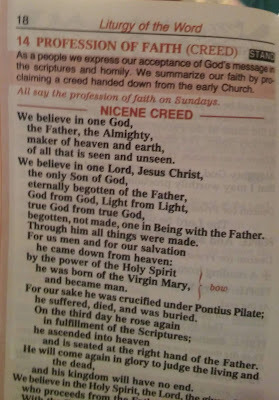 Note the wording: "In certain instances the Nicene Creed may be replaced by the Apostles' Creed.." Usage of the Nicene Creed remains the norm. "Because of the early origin of its original form, it [the Apostles' Creed] does not address some Christological issues defined in the Nicene and other Christian Creeds. It thus says nothing explicitly about the divinity of either Jesus or the Holy Spirit. This makes it acceptable to many Arians and Unitarians." Dr. Dietrich von Hildebrand warned that, "False irenicism is motivated by a misconceived charity at the service of a meaningless unity. It places unity above truth. Having severed the essential link between charity and defense of the truth, irenicism is more concerned with reaching a unity with all men than with leading them to Christ and His eternal truth. It ignores the fact that real unity can be reached only in truth. Our Lord’s prayer ‘that they may be one’ implies being one in Him and must not be separated from His words in John: ‘And other sheep I have that are not of this fold. Them also I must bring and they shall hear my voice. And there shall be one fold and one shepherd.’"
Many Catholics today, priests and laity as well as consecrated religious, possess a lust for innovation which they use to assault the stability of sacred rites. Referring to these liturgical terrorists who seek to violently replace divine forms with their own reckless innovations, John Henry Cardinal Newman warned that, "No one can really respect religion and insult its forms. Granted that forms are not immediately from God, still long use has made them divine to us; for the spirit of religion has so penetrated and quickened them, that to destroy them is, in respect to the multitude of men, to unsettle and dislodge the religious principle itself. In most minds usage has so identified them with the notion of religion, that one cannot be extirpated without the other. Their faith will not bear transplanting...Precious doctrines are strung like jewels upon slender threads." (John Henry Cardinal Newman, Parochial and Plain Sermons, Vol. II, Christian Classics Inc, pp. 75-76). Those who are bent on making their own unauthorized changes to the liturgy often fail to appreciate how such an endeavor can constitute grave sin. I know this because some have accused me of making a mountain out of a molehill for my opposition to various liturgical abuses. Dr. Germain Grisez explains: "There are many reasons why it is wrong for priests intentionally to make unauthorized liturgical changes. Two are especially important. First, such changes sometimes embody or imply deviations from Catholic faith; even when they do not, they often omit (see here for example) or obscure something of the liturgy's expression of faith. Thus, the Church teaches: 'The law of prayer is the law of faith: the Church believes as she prays. Liturgy is a constitutive element of the holy and living Tradition' (cf. DV 8). For this reason no sacramental rite may be modified or manipulated at the will of the minister or the community. Even the supreme authority in the Church may not change the liturgy arbitrarily, but only in the obedience of faith and with religious respect for the mystery of the liturgy.' (CCC, 1124-1125). There are five additional reasons why unauthorized changes should not be made in the liturgy. First, the liturgy is the worship of the Church as a body, and those who are ordained act as Church officials in performing liturgical roles. So, insofar as a priest makes unauthorized changes, he misrepresents as the Church's what is in fact only his or some limited group's. Even if this misrepresentation deceives no one and is intended for some good end, it is at odds with the reverence necessary for true worship. Second, this essential irreverence and the obvious arbitrariness of intentional unauthorized changes strongly suggest that the Eucharist is not sacred, and this suggestion tends to undermine not only faith in Jesus' bodily presence in the consecrated elements, but faith that the Eucharist is Jesus' sacrifice made present for the faithful to share in. Third, a priest who makes intentional, unauthorized changes acts with deplorable clericalism by imposing his personal preferences on the laity and violating the rights of those who quite reasonably wish only to participate in the Church's worship. Fourth, intentionally making unauthorized changes sets a bad example of serious disobedience to the Church's norms, and this bad example is likely to encourage some people to think and do as they please not only in liturgical and canonical matters, but in matters of faith and morals. Fifth...unauthorized liturgical changes often become a needless, divisive issue for the faithful, thus impeding the charity that the Eucharist should express and foster." "The reasons why priests should not make unauthorized liturgical changes also make it clear..that a priest's intentionally doing so is of itself matter of grave sin. Of course, many changes are in themselves very minor, and a few perhaps even are real improvements. But though this kind of sin admits parvity, such small changes also are scandalous, not only because they give the faithful a bad example of disobedience but because they contribute to a clerical culture in which liturgical abuse is widely tolerated and sometimes even expected, so that some are encouraged to engage in far graver abuses. Now, even a sin venial in itself becomes grave scandal when one foresees that it is likely to lead others to commit grave sin; thus, the element of scandal makes grave matter of even minor liturgical abuses likely to encourage more serious abuses by other priests. Due to widespread confusion and negligence of some bishops, many priests undoubtedly lack sufficient reflection regarding this sin." As you know, Saint Mary's Church here in Orange omits the Nicene Creed every Sunday and even during Vigil Masses. This, to me, is off. I'm still concerned that Fr. Shaun dropped the Saint Michael Prayer after Mass E. Why would he want to omit a powerful deliverance prayer? Laziness, I think, is more of a factor. The fact that the Apostle's Creed is shorter is probably more of a motivator for using it than any fear of offending visiting Unitarians. Most priests also take "shorter version" reading options whenever these are provided. I respect and read your blog often. From "Order of the Mass 2010, 19"
"...the Church expresses a desire that both creeds should be known and used by all the faithful. The Nicene Creed would remain that of common use while the Apostles' Creed would also be used on occasion. The mention of this latter creed's primarily catechetical origin as a baptismal symbol is an indicator of why it is proposed especially for Lent and Easter. Used in this way, the advantages of both creeds could be brought to the fore. The concise Apostles' Creed can be used to express the essential tenets of the faith in the context of baptism and the baptismal commitment. The more theological Nicene Creed affords an opportunity to deepen into these essential elements and into the mystery of Christ and of our salvation. It must also be remembered that historically it was the Nicene Creed that was first introduced into the Eucharistic liturgy. And this was not originally done to recall baptism but rather to express the fullness of the faith in Jesus Christ. Likewise, it is this creed, and not that of the apostles, that is liturgically recited by practically all forms of Christianity." The Nicene Creed remains, therefore, the norm. 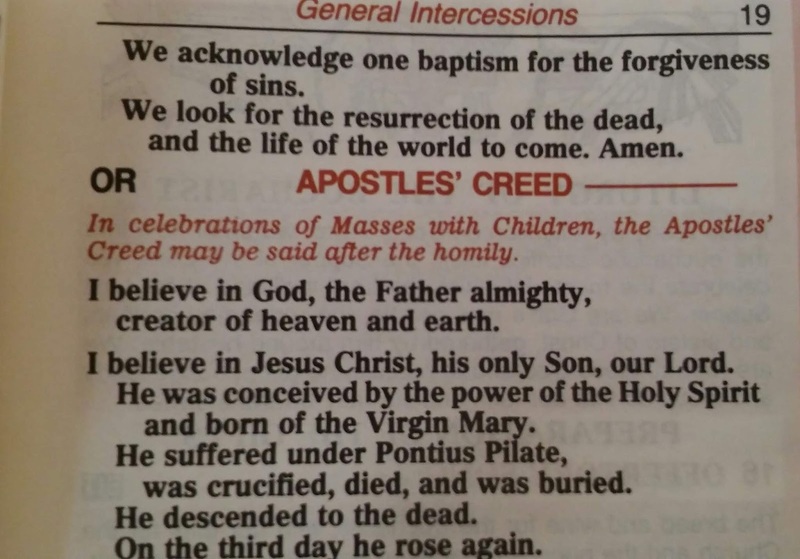 This is most unfortunate since the Apostles’ Creed is a uniquely Latin creed and using it separates us from the Eastern Churches, who always use the Nicene Creed, which is, historically, the only Creed ever sung at Mass in the Catholic and Orthodox Churches. It would appear that your priest is being divisive and seeks to engage in liturgical innovations in a bid to get attention for himself. But the Mass isn't about him.